All Saints Goodmayes (Goodmayes Lane, Ilford IG3 9SJ) celebrate 100 years of worship on their site over the weekend of 16th – 18th October 2009 with a Festival Weekend including a concert, flower festival, recitals, services and a Commission For Mission exhibition. • Friday 16th October: Art Exhibition & Flower Festival, 10.00am – 4.00pm. Music recitals featuring Commission For Mission member Alexander Chaplin will also be given throughout the day. Youth Service, 8.00pm. • Saturday 17th October: Art Exhibition & Flower Festival, 10.00am – 4.00pm. ‘The Glory of Sacred Music’ Concert featuring the All Saints Festival Choir and the East London Chorus, conducted by Alexander Chaplin, 7.30pm. •Sunday 18th October: Praise Service, 10.30am. Art Exhibition & Flower Festival, 11.30am – 6.30pm. Choral Evensong, 6.30pm. 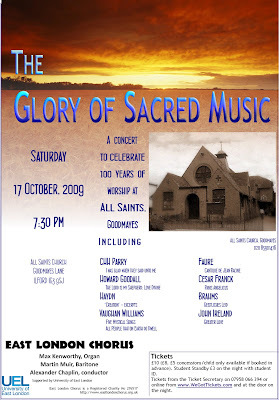 The programme for ‘The Glory of Sacred Music’ concert includes CHH Parry – I Was Glad When They Said To Me; Howard Goodall – The Lord Is My Shepherd, Love Divine; Hayden – excerpts from The Creation; Vaughan Williams – Five Mystical Songs, All People That On Earth Do Dwell; Faure – Cantique De Jean Racine; Cesar Franck – Panis Angelicus; Brahms – Geistilches Leid; and John Ireland – Greater Love. The East London Chorus will feature Max Kenworthy (Organ), Martin Muir (Baritone), and Alexander Chaplin (Conductor). Concert tickets are £10 (£8, £5 concessions/child only available if booked in advance). Student Standby, £3 on the night with student ID. Available from the Ticket Secretary on 07958 066394 or online from http://www.wegottickets.com/ and at the door on the night. Those attending any aspect of the Festival weekend will also be able to see the engraved windows on the Life of Christ by our Chairman, Henry Shelton, which gave him the initial idea for Commission For Mission.